Large slabs of production money, a cast of overblown celebrities and a who’s who of the world’s biggest brands. It should be the ingredients for a fiesta of creativity but instead it’s just like Trump’s Presidency; all puffery and bloated largesse, lacking class, wit, or whimsy. Let’s hope the half time entertainment is better. The New England Patriots and the Los Angeles Rams will play head to head in Super Bowl LIII, airing live Sunday on CBS from the Mercedes-Benz Stadium in Atlanta. Although many tune in to watch the kick-offs, touchdowns and all the other action on the field, others tune in for the entertainment that happens beyond the sidelines and in between the action during the big game. As always, advertisers and companies will feature their commercials, worth millions of dollars, specifically curated and created for Super Bowl Sunday — many of which have already hit the web. This year, Carrie Bradshaw, Cardi B, Jeff Bridges, Michael Bublé and more will be the celebrity faces for the weekend’s most-viewed commercials. What a waste of money. This is so lame it looks like it was written by the client, as no creative worth their salt would ever have agreed to have their name tagged to this odious albatross. I watched it and rolled my eyes. Taking two cultural treasures such as Carrie Bradshaw and “the Dude” only to mire them in a mirthless banal plug for beer was almost too much to take. Yes, I watched it and a day later I had trouble recalling the beer brand behind it, it was that forgettable. Note to self, never ever drink Stella Artois. If this is how careless and sloppy they are with their Super Bowl ads, I can only imagine how rubbish the taste of their beer is. For its second Super Bowl appearance ever, Pringles is following the approach of several other companies by incorporating technology into its oddball Sunday night commercial. Playing on Pringles’ tagline as a stackable snack, the commercial sees two men sitting in a room full of open Pringles cans creating their own towers of flavour. A cringeworthy ad for a cringeworthy product. In another beer ad, a buff robot shows how it can blow all the puny humans away in running, boxing and golf, then is sad when it realises even all the workouts in the world won’t allow it to enjoy a beer. Lame. Donning a black jumpsuit and holding a piece of avocado toast, Kristin Chenoweth trains a couple of canines to sing the “Avocados from Mexico” jingle. In the teaser, three dogs sit before the Broadway and television star howling to create a cacophonous mess. Before they try again, Chenoweth shows them how it’s done, singing the jingle in an operatic manner with high notes. This is just stupid. So, not all the ads sucked as badly as the Stella ad. In the advertisements that follow, FIB has picked out a few of the decent ones. In the first-ever Olay commercial for the Super Bowl, Buffy the Vampire Slayer’s Sarah Michelle Gellar returns to her horror roots. Evoking major I Know What You Did Last Summer vibes, the commercial features Gellar performing her skincare routine with Olay products while a masked figure haunts her from afar. It got a chuckle from me. , “Are puppies OK? Is a shooting star OK? Is the laughter of a small child OK?” interrogates Carell, before Lil’ Jon reinforces his line of thinking. Not too long after, Cardi B storms into the restaurant saying her signature “okur” as her song “I Like It” plays upon entrance. Anything Steve Carell does is pretty funny. Michelob is smartly capitalising on the ASMR (autonomous sensory meridian response) craze, which has people loving videos that make specific sounds that create a tingly sensation in some listeners. Zoe Kravitz whispers, clicks her fingernails on a beer bottle, and pours the fizzy drink. ASMR-ers will love it (the video already has a whopping 10 million views in just three days) but some of us will never get the appeal. In the Mercedes-Benz ad for Super Bowl LIII, prominent Hollywood figures obey every command. Over a funky tune, the commercial shows a man commanding the world to go his own way. With this power, he influences the outcome of a golf game, finds and returns a lost cat home and more. When sitting in on an opera the man says, “Change the music,” which then transforms the play’s lead into Ludacris who begins rapping “When I move you move”. Which is well chosen. The 2019 ad ends with a preview of the new Mercedes-Benz that includes a new high-tech voice command feature. Thumbs up. Featuring a truly Hollywood line-up, Amazon’s Super Bowl LIII advertisement jests at failed Alexa devices that didn’t work according to plan. Forest Whittaker’s podcast-playing toothbrush, adorned with Alexa’s glowing blue ring, fails to perform its function. When Ilana Glazer and Abi Jacobson of Broad City ask their Alexa hot tub to play music, it transforms into a dancing fountain that blows the stars out of the water. 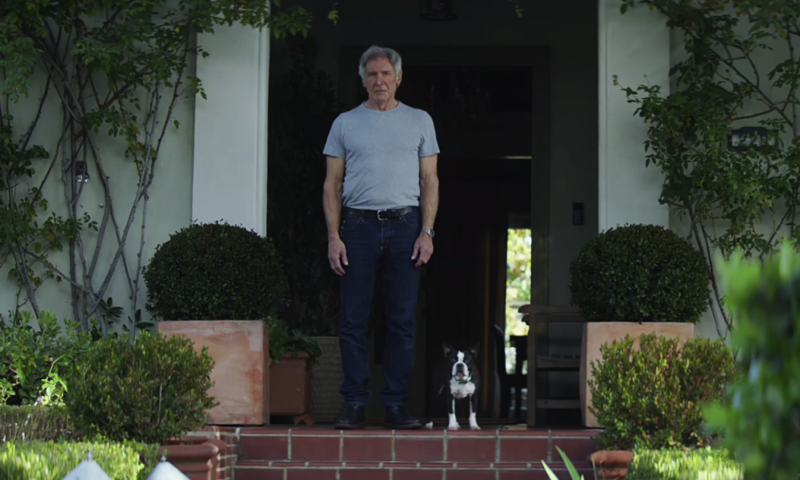 Harrison Ford’s Boston Terrier, however, makes the best of its Alexa dog collar. The commercial also features twin astronauts Mark and Scott Kelly having their own mishaps with the virtual assistant as Queen’s “Don’t Stop Me Now” plays. At the end of the advertisement, Ford’s furry friend’s wishes are fulfilled as a delivery man presents multiple bags of dog food. “I’m not talking to you,” the actor says to his dog. Poking fun at yourself is always a welcome comic technique. Which ad from this year’s Super Bowl was your favourite? Let us know in the comments.